My acknowledgement to the traditional owners of the land, the Warundjeri people. Thank you to Reconciliation Australia for asking me to speak today. It is a great honour and privilege to celebrate with the finalists of these awards. Awards which recognise the successful efforts of indigenous Australians - people who are great survivors, people who have succeeded against the odds. That wasn’t Sir William Deane or Malcolm Fraser, or Paul Keating. It was the Prime Minister –in May this year. When we hear John Howard talking like that, I hope we can confidently say that the history wars are over. The history wars that so polarised debate and thinking in indigenous affairs. Let’s all hope that it is now time to move on. Let’s also hope that the Prime Minister’s words now represent an important coming together on these issues. That said, I suspect there is still a significant proportion of the Australian population who believe ours is a decent society populated by decent people and that therefore it cannot be that we have wronged the First Peoples of this country. Overwhelmingly we are, and have been, a decent society. But I say, “not so” when it comes to our indigenous people. the terms on which we share the land and live together. Important words for us all to think about. When it comes to our indigenous fellow Australians, we are not yet a decent or a just society. It seems incontestable that we have done our best to humiliate these, our fellow Australians. Whether by the brutal denial of their rights, whether by benign neglect or whether through the paternalism of welfare, we have denied them their sense of self worth and human value. We continue to humiliate them. For 217 years, the message we have given them is that their lives, their culture, their spiritual identity are less valuable than ours. In the Australia of 2005 – never richer, never more self-confident – that is unacceptable. First, we must satisfy the indigenous people of this country, the people who carry the scars of our history, that we have accepted the truth of our past. Some kind of national compact agreed by - first the Federal Parliament - and ultimately the people of Australia, would be a good, if not essential, start. That is, in my view, a prime ministerial challenge, a challenge ideally suited to John Howard, our current Prime Minister. I say ideally suited, because John Howard is in a powerful and commanding political position, with the capacity to bring the whole of the country with him. I can’t imagine another prime minister having this opportunity for a long time to come. Second, we must as a people agree emphatically that the conditions in which indigenous people live today are utterly unacceptable in a decent society. We must with sustained determination help empower every indigenous community to obtain the housing, roads, sanitation, education, medical care and, very importantly – meaningful work – things which are desperately needed and which most Australians take for granted. John Howard has referred to “… the need for an ongoing, persistent rendition of practical, on the ground measures to challenge the real issues of indigenous deprivation”. In saying this, I think he has laid down a challenge for himself, his government and for all of us with the skills and resources to participate. Most critically that includes corporate Australia, many of whom have in recent times started to face up to this challenge. Third, we must recognise, as Noel Pearson so rightly points out, that indigenous people have been relegated to the fringes of society by the insidious effects of welfare dependency. A fortnightly dole payment does not absolve us of our responsibilities and is in every way inimical to economic independence. Fourth, we must come to appreciate and understand the richness of Aboriginal culture and its centrality to indigenous citizenship and the soul of this country. Finally, we must provide the necessary political, legal, social and economic frameworks so that indigenous Australians can fully participate in the life and benefits of this country as its First Peoples, as peoples who continue to live and celebrate their own unique cultures. For how long do we have to still hear Aboriginal leaders saying these things? In so many ways it beggars belief that these things still need to be said after 200 years. In the 19th Century, Aboriginal Australians were victims of European expansionism in the fight for possession of this continent. In the 20th Century they were victims of our paternalism and our simplistic welfare solutions. In this, the 21st Century, let’s give indigenous Australians the space to visualise and exploit, on an equal footing with non indigenous Australians, the opportunities that this wonderful country of ours has to offer. And we have much to be optimistic about – there are plenty of good stories out there and we are celebrating some of them today. Stories about indigenous organisations alive and flourishing in contemporary Australia. Good stories apart, for too long Aboriginal Australia has been seen as an encumbrance, an embarrassment, an issue we wish would just go away. But the nagging, persistent voice of conscience will not be answered without just and lasting change. We can tell ourselves that it has nothing to do with us. But it has everything to do with us. I am not saying that the task is easy. On the contrary, it is very hard. But we are not talking about several million people here; we are talking about 400,000 of our fellow Australians. The challenge cannot be beyond us. We are the beneficiaries of the dispossession. For the life of me, I cannot understand how anyone could disagree with these words. Having said that, it is not too late and together we have the knowledge, the wit, the wealth and the decency to fix it. And fix it we must, without disempowering indigenous people as victims or as sidelined observers to their unfolding future. We share with them the responsibility for a better future. I want to emphasise that indigenous people are demanding this better future in so many ways. We should never underestimate their determination and staying power. Because despite all that has happened, indigenous people have, with great steadfastness, survived and they continue to press their claims on us in so many ways. Through the courts, through their political demands on government and in the efforts they are making with corporate Australia. I should also mention the challenge that this presents to the indigenous leadership – both the elders and the next generation. that indigenous people, far from belonging on the fringes of our consciousness, are in fact at the very centre of what it means to be an Australian. After more than two Centuries, we must tend to our great unfinished national business. We must understand the truth of how this modern Australia came to be. We must with indigenous people work out how together we can share this land so that indigenous people participate at every level of society as indigenous citizens, as Australia’s First Peoples. Finally thanks to Reconciliation Australia and BHP Billiton. Prindiville on the mend, and Sudla? Gerry Prindiville was seen in Redfern by several parishioners during the past week. The community is pleased that he has recovered sufficiently from his illness to continue his recouperation back "home". The Neocats continue to be secretive about their movements at Redfern - but it appears that Prindiville will not be acting as PP for some time yet. In his absence they have provided various stand-ins, all unannounced, including Eric Scruzny, John Hayes, and most recently the Dominican Neocat, Fr Nick. And where, the Church Mouse wonders, has the assistant PP been since the PP fell ill? Sudla was part of the Australian contingent in Cologne for the world youth circus, and has not been heard of since. Could his absence be somehow related to a certain defamation case being heard by the Church Tribunal in Sydney? Father Ted Kennedy, the much beloved friend of the aborigines and former parish priest of Redfern was buried in May from the Block in Redfern with much ceremony but very little pomp. This unique event, which took place in a huge marquee erected especially for the occasion, will not be easily forgotten by the many hundreds of people who turned out on that overcast Tuesday in May. It was a stirring celebration of the life of a remarkable priest and an extraordinary man. 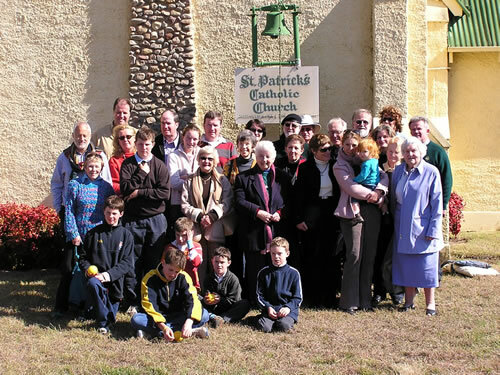 On Sunday 14th August a small group of family and friends gathered in the tiny church of St. Patrick's in the beautiful Araluen valley to celebrate a memorial mass for Ted. Ted's sister Marnie and Ted's niece and nephews and their families were all present as were Ted's cousin from Ireland, Ted Casey and his family. Father Mark Croker the parish priest of Braidwood and Bungendore, knowing of the Kennedy connection with the area, had kindly offered to say the mass. Ted himself had had a great love of the area and had introduced many of his friends to the delights of the district. He had often celebrated mass in St. Patrick's in his earlier days. His family had a long association with Araluen and he loved nothing better than to spend time in the valley. He was particularly delighted in the last few years with the family plans to build a new house and in the knowledge that there was to be a continuing Kennedy presence in the valley. This was a more modest, personal and intimate occasion than the great Redfern celebration. Nonetheless it was a fitting complement to that splendid public celebration and it dealt with less well known but important facets of Ted's life such as his pivotal role as chaplain to Sydney University. There was an opportunity too for fond reminiscence and touching tribute, and Ted's nephew John provided details of the family's Araluen history. Ted would have been particularly delighted in the wonderful singing of Christine Tilley and the reading by Jeremy Nelson of some of his own poems. The Church Mouse is not quite sure what to make of the following item from the Holy Mousepad [sic] column of yesterday's Online Catholics. This is the first issue of Online Catholics edited by Chris McGillion, whose apologetic maiden editorial is laden with trepidation at the thought of filling the shoes of his extremely capable predecessor, Kate Mannix. John Brogden's self-harm caused a large amount of soul-searching about the role of media and public pressure in pushing a leader to the edge. A few weeks earlier, the defiant Redfern parishioners attempting to preserve the style of ministry of the late Fr Ted Kennedy must have feared their activism had somehow played a part in causing the serious ill-health of current parish priest Fr Gerry Prindiville. Like Brogden, Prindiville had - in their view - indulged in a fair amount of inexcusable behaviour. He had dismantled many of the religious practices and symbols that existed in the parish. Conceivably, being constantly forced to account for his actions took its toll on Prindiville's health. In late July, he was seriously ill in Calvary Hospital, Canberra, with a pulmonary embolism (blood clot on the lung). Eventually, on 22 August, the editor of the group's Church Mouse Journal wrote, convincingly: "We are happy to report that the health of Fr Gerry continues to improve".